VATICAN CITY -- In an opulent Vatican room designed in the 16th century for papal meetings with kings, a cardinal read, "We confess that we have shielded the guilty and have silenced those who have been harmed." "Kyrie, eleison," (Lord, have mercy) responded Pope Francis and some 190 cardinals, bishops and religious superiors from around the world to the confessions read on their behalf by Cardinal John Dew of Wellington, New Zealand. After three days of meetings, nine major speeches and heartbreaking testimony from survivors of clerical sexual abuse, participants at the Vatican summit on child protection and the abuse crisis gathered in the Sala Regia (literally, "royal room") of the Apostolic Palace Feb. 23 for a penitential liturgy. The centerpiece of the liturgy was the reading of the story of the prodigal son or, as the Vatican termed it, "the merciful father" from Luke 15:11-32 and a long "examination of conscience" that asked the bishops as individuals and as presidents of bishops' conferences to be honest about what they have done and what they have failed to do to protect children, support survivors and deal with abusive priests. While Pope Francis presided at the penitential service as part of the Vatican summit on child protection and ending clerical sexual abuse, Archbishop Philip Naameh of Tamale, Ghana, gave the homily. 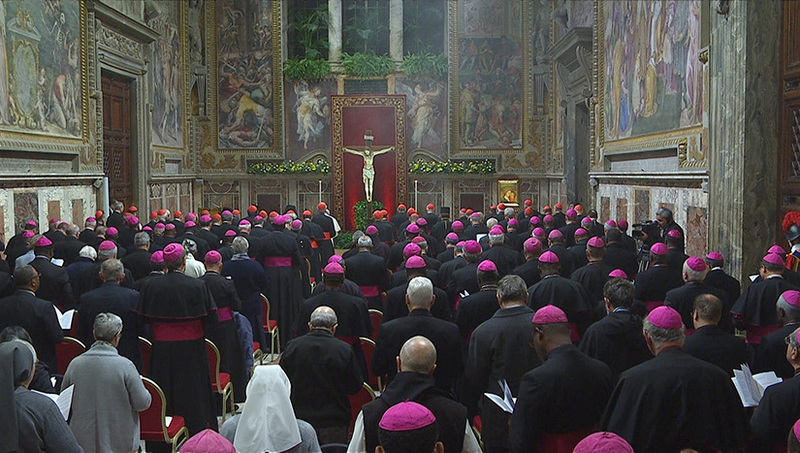 Pope Francis, cardinals and bishops attended a penitential liturgy during a meeting on the protection of minors in the church at the Vatican Feb. 23. He told the pope and his brother bishops that they all preach often about the parable of the prodigal son, encouraging their people to return to God and seek forgiveness. But, he said, "we readily forget to apply this Scripture to ourselves, to see ourselves as we are, namely as prodigal sons. Just like the prodigal son in the Gospel, we have also demanded our inheritance, got it, and now we are busy squandering it." "The current abuse crisis is an expression of this," Archbishop Naameh said. "Too often we have kept quiet, looked the other way, avoided conflicts," he said, adding that the bishops were often "too smug" to confront "the dark sides of our Church." Failing to act, he said, they "squandered the trust placed in us." And, claiming brotherhood in the College of Bishops, he said, even those bishops who have not had to deal directly with an allegation of abuse against a priest in their diocese share the responsibility of having failed to act. In the Gospel story, the archbishop said, the first step toward receiving the forgiveness of the merciful father is for the prodigal son "to be very humble, to perform very simple tasks and not to demand any privileges." Like the prodigal son, the bishops must recognize their mistakes, confess their sins, speak openly about them and be "ready to accept the consequences," Archbishop Naameh said. A survivor of abuse also spoke, calmly and softly telling the pope and bishops that as a victim, "what you carry within you is like a ghost that others cannot see. They will never see you nor completely know you." The memory of the abuse is always there, said the man, who was not identified. "There is no dream without the memory of what happened. No day without memories, no day without flashbacks." "I try to concentrate on my divine right to be alive. I can and should be here," he said, choking up. "This gives me value. Now it is over and I can continue forward, I have to go forward." He went forward by picking up a violin and playing an instrumental piece for the group. Then, since it was a liturgy, he walked down the central aisle in silence. During the liturgy, summit participants were asked to meditate on how they and the Church in their countries have "responded to those who have experienced the abuse of power, of conscience and sexual abuse" and to consider "what obstacles have we put in their way?" They were asked how they treated bishops, priests and deacons accused of abuse and how they dealt with those who were found guilty. The examination of conscience continued, looking at how the bishops and religious superiors reached out to or failed to reach out to the communities where guilty clerics served and examining the steps taken to ensure that in the present and future children are safe in Church institutions. After a litany of "we confess" to failures to act, the pope and summit participants prayed "for the grace to overcome injustice and to practice justice for the people entrusted to our care."